California has spent about $140 million over the past three-plus years to find foster parents for the state’s most vulnerable children, but some advocates are worried that some of these funds were little more than a giveaway to county child welfare departments, with little oversight from the state and an uncertain impact. In looking at one year—the fiscal year 2016-2017—counties across California spent more than $40 million collectively to help support relatives during drawn-out approval processes brought on by state reforms. That same year, Riverside County spent more than $1.7 million importing a successful recruitment model from St. Louis. But other counties spent the money on office supplies, such as color printers and ink, laptops and Wi-Fi-jetpacks. Even with the huge influx of funds with very few strings attached, many counties have still struggled to recruit new foster parents. And some of the money still has not been spent. In 2016-2017, more than half of the allocated money—or nearly $23 million— had not been spent by the end of the year. The state has made strides in recent years to find more caregivers for foster children, but the number of foster parents in California today still lags behind the 2012 total, according to recent national analysis of foster care placements by The Chronicle of Social Change. Facing a foster home shortage that threatens to jeopardize its new foster care reforms, California has given counties $139.5 million to recruit and retain foster parents over the past four fiscal years, beginning in the 2015-2016 fiscal year and extending to the current fiscal year, when the funding will expire. That mammoth outlay is believed to be the largest single investment in foster parent recruitment and retention in U.S. history. But in examining the expenses, The Chronicle of Social Change found the program, known as the Foster Parent Recruitment and Retention Services (FPRRS) fund, was a mixed bag with a nebulous impact on the number of new caregivers in the state. 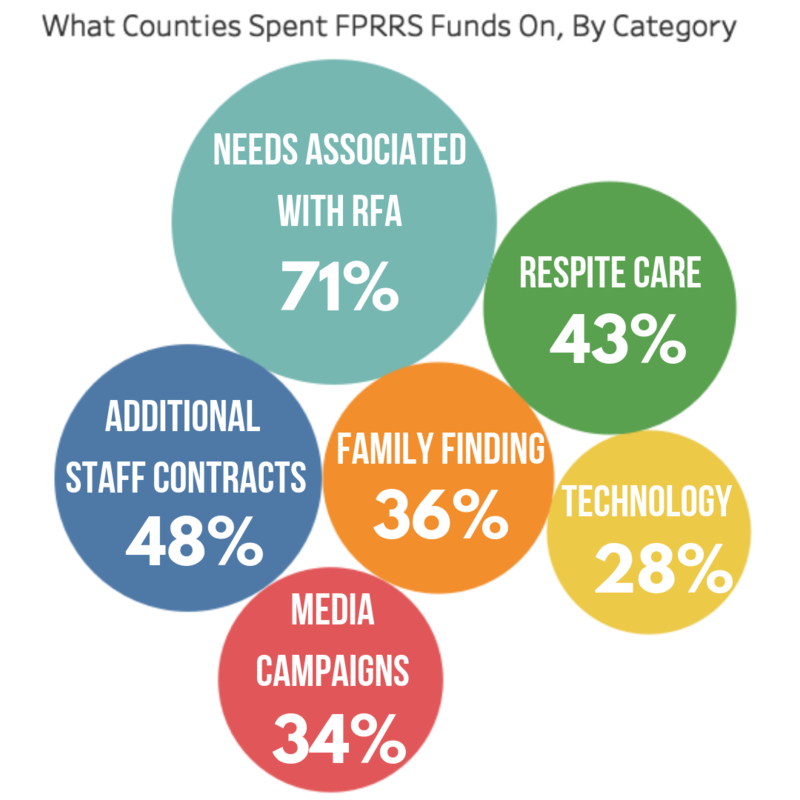 But with FPPRS funding set to expire at the end of this fiscal year, several counties voiced concern that the program had not yet helped them build a surplus of caregivers. In a child welfare arena that continues to focus more on evidence and evaluation, there are few proven strategies to drawing more foster parents. This is perhaps why Congress included a paltry $8 million for foster parent recruitment in its recent child welfare overhaul, the Family First Prevention Services Act. It offers competitive grants to states to support the recruitment and retention of foster parents. But with the federal government’s moving to a greater reliance on evidence-based practices in the Family First Act, there may be wariness of larger investments in recruitment efforts, despite an effort to place children in family settings. Determining what causes people to “make the call” to sign up as foster parents can be difficult, according Denise Goodman, one of the nation’s leading experts on foster parent recruitment. With very few studies on foster parent recruitment, most states lack an evidenced approach to recruiting and retaining foster parents. The state allocated the nearly $140 million in four waves to improve the quality of foster homes and increase the number of new resource family homes, as foster families and relative caregivers are now known in California. ‍‍According to the California Department of Social Services (CDSS), funds were to be used by child welfare and probation departments for things like hiring staff and intensive family finding. "FPRRS money was designed as a start-up investment,” said Michael Weston, a spokesperson for CDSS. “Moving forward, counties can reinvest money associated with cost savings from reductions in congregate care into foster parent retention, recruitment and support activities." When a member of Nancy’s* extended family couldn’t take care of their newborn daughter in Los Angeles County, Nancy stepped up — but the county’s slow caregiver approval process cost Nancy her job and her savings. Nancy had the funds to purchase a crib, diapers and other things the newborn needed. She knew if she budgeted she could make it the 90 days she was told the county would take to approve Nancy’s home. It took an additional nine months before she was approved. Nancy was one of hundreds of caregivers who received emergency placement stipends, funds earmarked to help caregivers help support a child while their application was in the process, but it was too little too late for her to pay for all the extras that come along with parenting an infant. When the state rolled out its Continuum of Care Reform in 2017, it was hoping to place fewer children in institutional settings like group homes and more with families. But getting resource families through the approval process proved to be a difficult ordeal. Caregivers like Nancy who took in a child as an emergency placement often faced months-long waits for approval without support (though state legislators recently stepped in with a plan to fix the process). But Nancy said that three months of $400 emergency-stipend checks didn’t go far enough. She had a difficult time finding a sitter for the sick newborn and was let go at her job because of it. “Nobody was able to easily go through this process,” Nancy said. Genie Chough, assistant deputy director of the LA County Department of Children and Family said the county spent more than $4 million, a majority of its FPRRS money, on emergency placement stipends. Nancy is now working on adopting the little girl she took in. But for other caregivers who got stuck in the approval process, limited support wasn’t always enough to stabilize the placement of children in their homes. That backlog of relative caregivers in the RFA process also meant other recruitment efforts had to be put on hold, Chough said. Over the past three years, the number of foster homes in Los Angeles County has only grown by 102. “It [FPRRS] didn’t serve the purpose for which it was intended,” Rexroad said, adding that a lot of the money had to be diverted to relatives in order to mitigate the relatives not receiving funding at the time of placement. She said she can’t criticize the counties for this but it was discouraging. It’s not just about relative family members, counties are also helping foster parents who took in children with additional needs using FPRRS funding. In Contra Costa County, a diabetic 10-year-old foster child who was unable to walk and needed to be catheterized every three hours needed a home. But Lori Castillo, lead division manager for resource family approval, knew she needed someone special for the 10-year-old. She was fortunate to find a woman who had been a nurse for 25 years. But even a capable caregiver needs some extra support for a child with special needs and Castillo was able to provide that. Many counties included tangible supports in their FPRRS plans from 2015-2018, some of which say they can only do so with this funding. But Rexroad of California Alliance of Caregivers is worried this focus is misplaced. She said it isn’t difficult to get people in the community to do a diaper drive or donate furniture. “If they had invested in a partnership with another organization, they could still have enough to acquire those goods,” Rexroad said. For smaller counties, that might not always be an option, though. Located at the far northwest corner of the state, Del Norte County’s population is small, only about 25,000 people. While the community is supportive, it’s also already helping other programs such as Little League and various school programs, said Julie Cain, program manager at Del Norte County Department of Health and Human Services. Bridgette Hernandez, regional manager of Riverside County Department of Public Social Services, felt hard-pressed to try out a new approach in her county. Using more than $1.1 million of the county’s FPRRS allocation, Riverside County contracted with the Foster and Adoptive Care Coalition in St. Louis, the nonprofit organization that created the 30 Days to Family program. The county received training and grew to understand the program. The second year, with more than $1.5 million of the county’s FPRRS allocation, Riverside took the parts of the St. Louis program that worked and changed the parts that didn’t, creating the Family Connections program, now an entire division in Riverside County that identifies viable placements within 30 days. Fresno County purchased office supplies and color printers with its recruitment funds in 2016 and 2017. San Bernardino County purchased 22 laptops for social workers in 2016. And Kern, Modoc and Nevada counties purchased laptops, Wi-Fi-jetpacks and document scanners. Advocates are worried how exactly these fit into foster parent recruitment and retention. Susanna Kniffen, director of child welfare policy at Children Now, a nonprofit child advocacy organization, says expenses like these should be looked at more thoroughly. “The state should provide more guidance to counties on appropriate uses for FPRRS funds, review spending reports from the counties, and work with counties who do not appear to be using the funds in the most impactful way possible,” she said. One of those counties is San Diego, said Susan Gibb, California Alliance of Caregivers Southern California’s director. In 2016, San Diego County reported spending $242,361 on respite care, which was also supported using FPRRS funding in 2017. But Gibb said there are so many restrictions that she hasn’t been able to use it. She said that’s true for many other foster parents, too. Gibbs is also concerned about the number of programs that reportedly used FPRRS funding but previously existed, without a noticeable difference or change. San Diego said its YMCA Kinship Services and Initial Training Classes for Foster and Adoptive Parents expanded with FPRRS funding and it added Permanent Connections, which provides family finding for children. But Gibbs doesn’t feel heard. She said that San Diego’s foster parent community voiced multiple suggestions for the funding, such as trauma training, training to parent older children and school transportation, “but none of them got traction or even a response,” she said. Despite the reports being public, Kniffen said the difficulty of declining standards in the reports is making it difficult to tell what the counties are spending their FPRRS funds on. 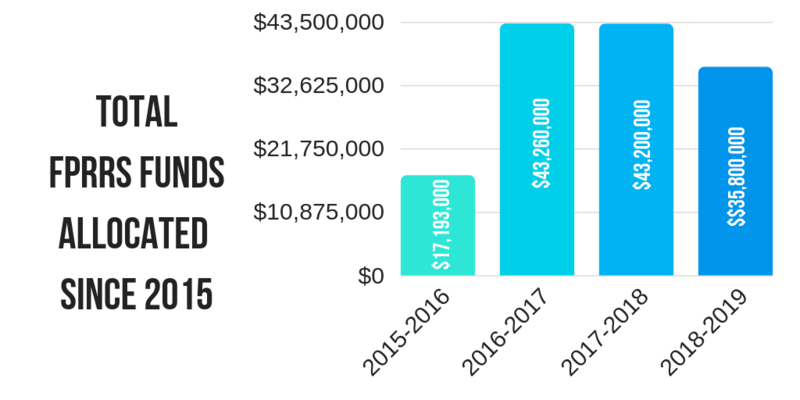 Stanislaus County had more than $1 million in funding in 2017-2018. Its FPRRS report only reflects the money being spent on tutoring, psycho-social assessments and an extreme recruiter social worker position. But the report doesn’t list how much was spent. The report includes the possibility of co-sponsoring a recruitment event but doesn’t specify any official plans. The reports also vary over the years in format and types of questions asked. The 2015 reports asked everything from demographics to how much would be spent on each activity, while the most recent reports lack any information about how much is spent on each activity or overall. Many counties had difficulty spending the money. 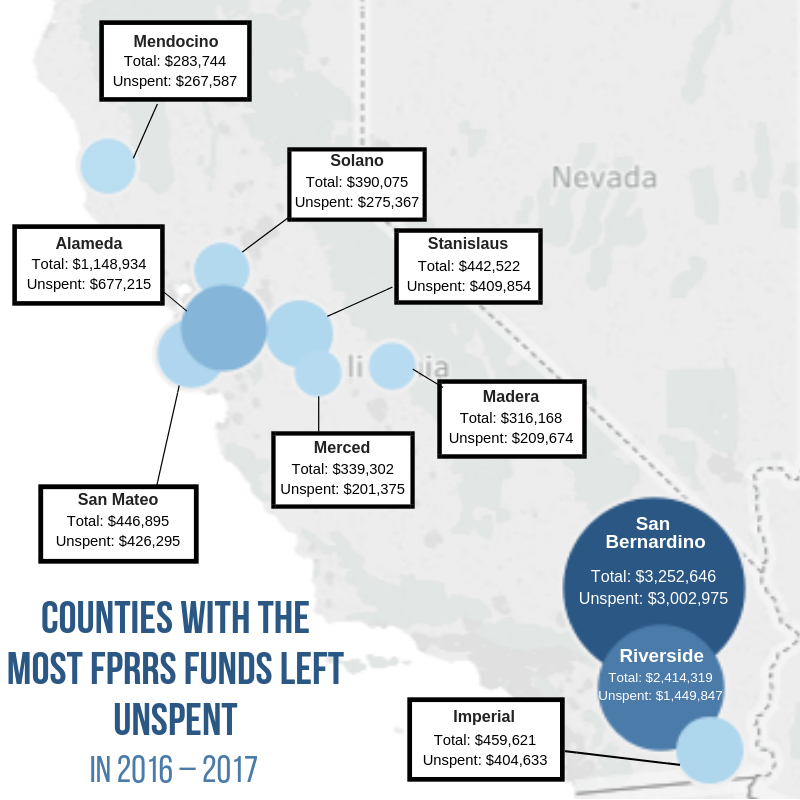 In fiscal year 2016-2017, nearly $13 million in FPRRS funds went unspent in California counties, with more than $3 million going unspent in San Bernardino County alone. Riverside County was left with about $1.5 million in unused funds during the same time. That money rolled over to the next year, but some still remains difficult to spend. Some counties credit this to time frames and a misunderstanding of how the funds could be spent. Other counties had unspent funds due to not being able to fill job positions. Between RFA problems, a lack of oversight and limited time, advocates feel FPRRS funding has barely scratched the surface of what is needed to recruit and retain foster parents in California. Even with the $103 million spent so far, California hasn’t necessarily seen a substantial increase in foster homes in many counties. ‍‍Contra Costa was allocated more than $2 million in 2017. But the county closed homes that didn’t take in a child that year, reducing the number of foster homes in their county. 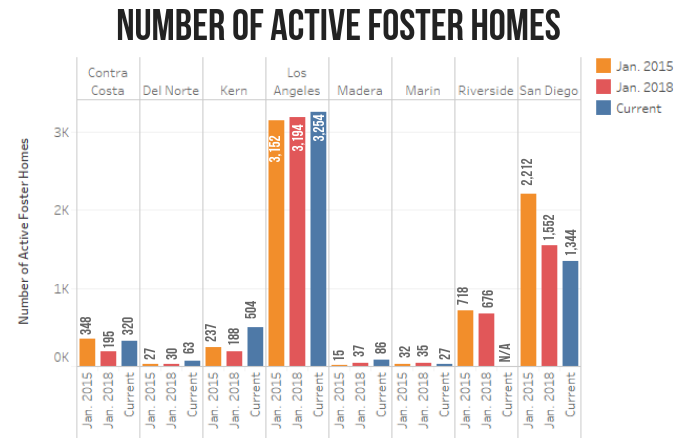 In 2015, Contra Costa had 348 foster homes. Currently, it has 320 county-licensed foster homes. In the 2017-2018 FPRRS report, Sacramento County suggested a different way to use the limited funding: crafting a large scale recruitment effort run by the state, not individual counties. “With a statewide campaign serving the shared recruitment need, counties could be afforded the opportunity to focus more efforts on retention, which involves more individualized planning between counties,” Sacramento County said. But Rexroad with California Alliance of Caregivers has an even simpler solution: Ask foster parents what they need. “In counties where they asked the foster parent what supports and services would best support retention and recruitment, we felt the monies in those counties were better spent,” she said. She said she was told that it was too expensive and time consuming to talk to caregivers. So Rexroad took on the task herself, coming up with what she said is the first statewide caregiver policy agenda. Rexroad said programs focusing on mentoring, respite and one day orientations are some of the best ways she’s heard FPRRS money being spent. She also said it was encouraging to see more foster parent liaison positions through this funding. Overall, she said, it’s just about more communication between foster parents and counties. “They can get a lot of bang for their buck if they get stakeholder input,” Rexroad said.